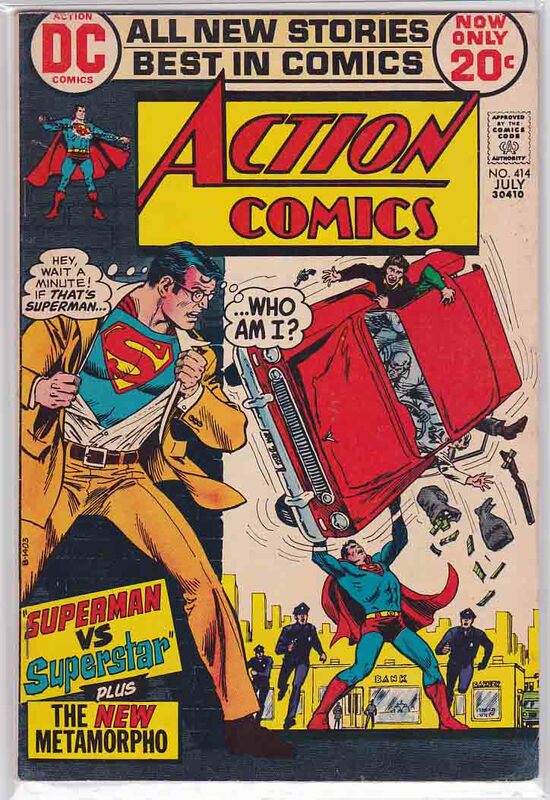 Action Comics is an American comic book series that introduced Superman, the first major superhero character as the term is popularly defined. The publisher was originally known as Detective Comics , Inc., and later as National Comics and as National Periodical Publications, before taking on its current name of DC Comics . 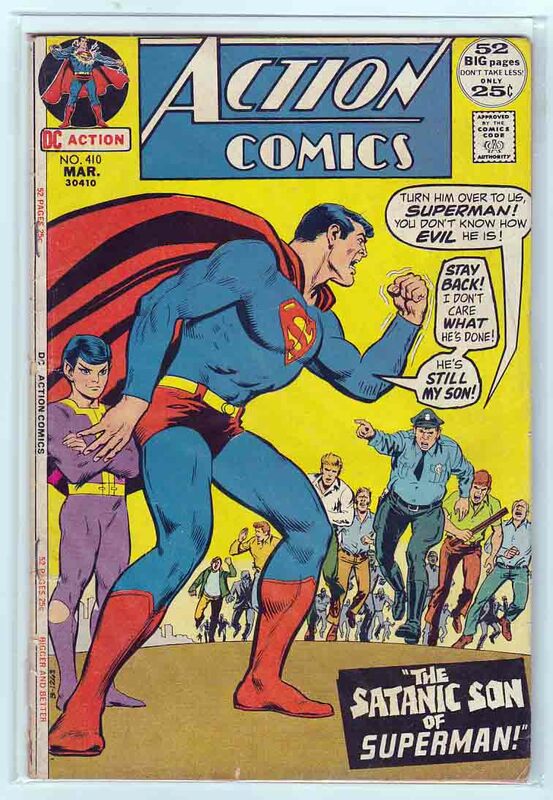 ACTION COMICS #312 (1964) Curt Swan Pencils & Cover. 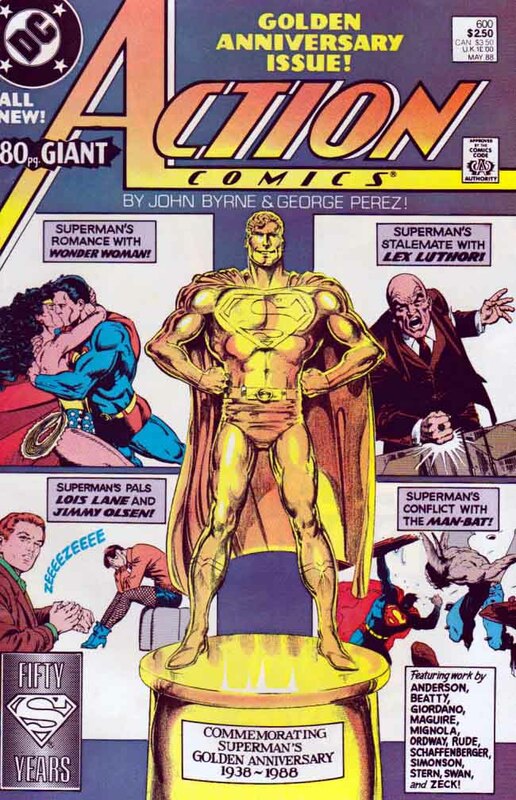 Robert Bernstein Pencils.Clark Kent gets turned into a Metallo with a Kryptonite heart after he is mortally wounded by a policeman’s bullet, only to find out that Superman’s “tyranny” has been a ruse to prevent the world from panicking over an alien attack. 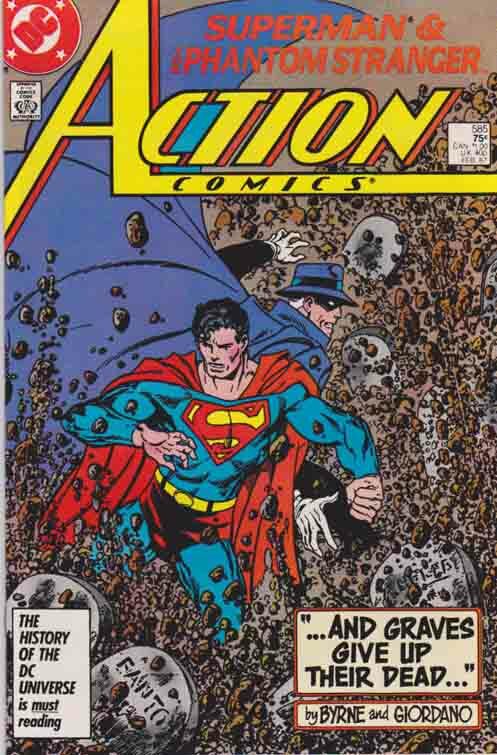 After the danger is dealt with, Clark remerges with Superman, who gives up his rule over Earth. 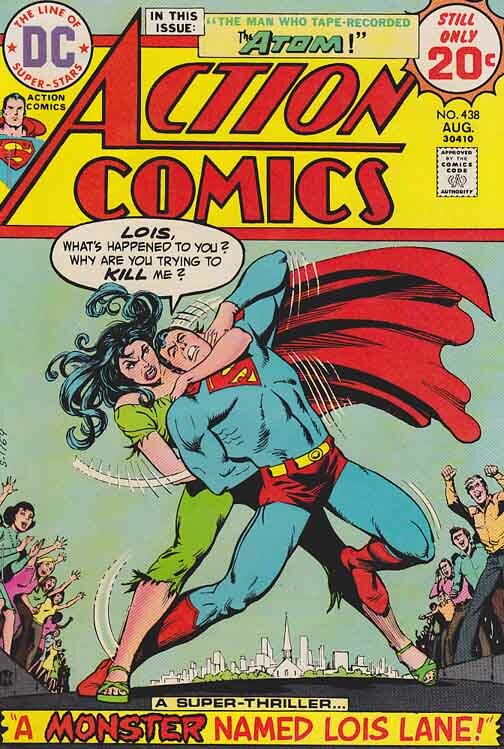 ACTION COMICS #385 February, 1970 Curt Swan Pencils. 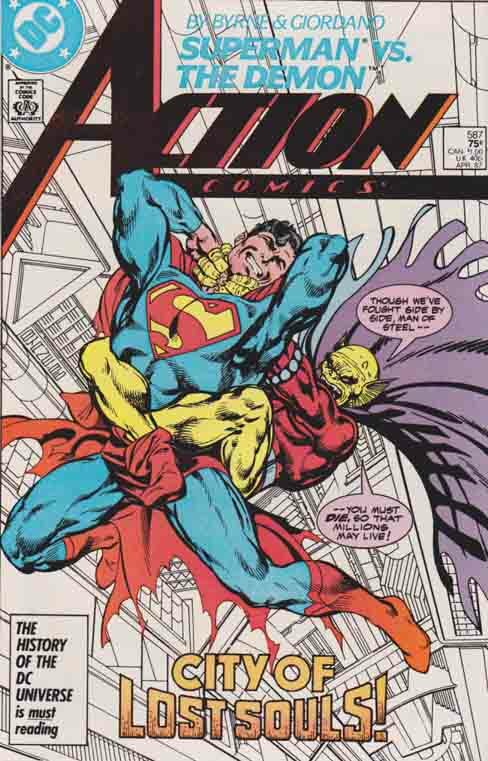 The Time-Trapper covertly induces Superman to use a defective time-bubble to journey to the year 101,970 A.D. and places a time-barrier behind him, preventing him from returning to his proper era. 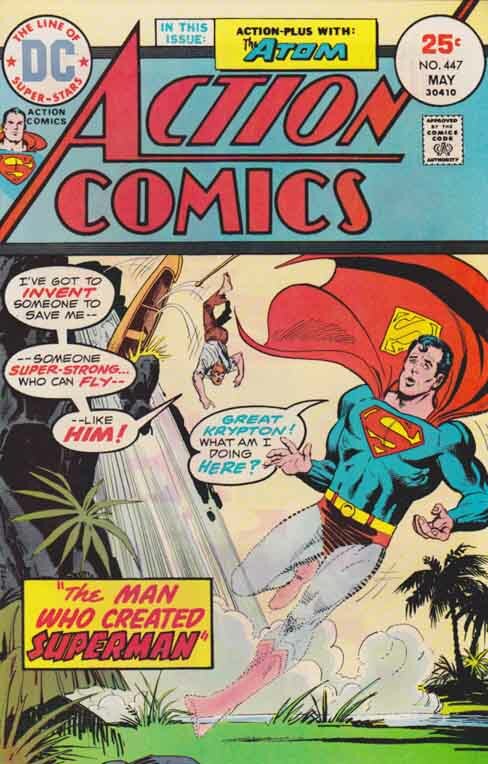 ACTION COMICS #410 (1972) Nick Cardy Cover, Curt Swan Pencils, Cary Bates Story, 52-page giant "The Satanic Son Of Superman" Superman learns that his son, Krys, has caused many disasters over his 10 year lifetime. 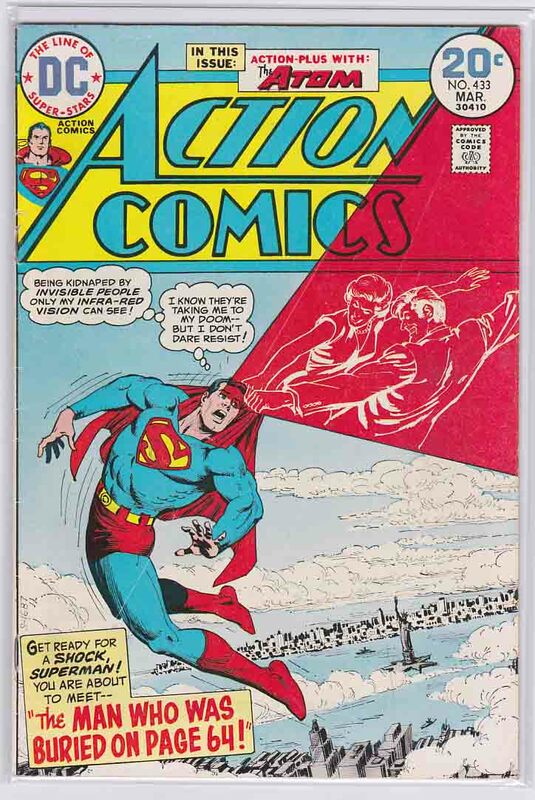 ACTION COMICS #414 (1972) Nick Cardy Cover, Curt Swan Pencils, Cary Bates Story, Gregory Reed (First appearance) (Actor who portrays Superman in movies & TV in DC Comics) "Superman vs. Superstar!" Gregory Reed, an actor who plays Superman in movies but is secretly jealous of the Man of Steel, uses magic to transfer his mind into Superman's body and vice versa. 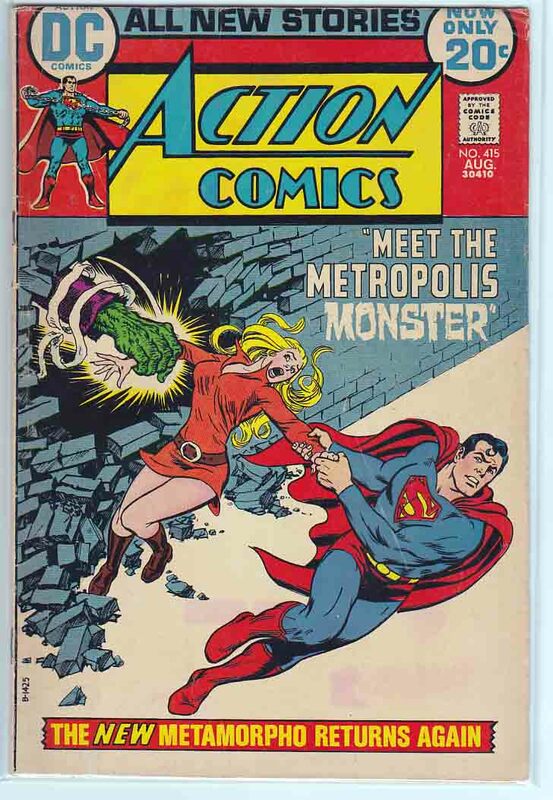 ACTION COMICS #415 (1972) Nick Cardy Cover, Curt Swan Pencils, Cary Bates Story "Meet the Metropolis Monster!" 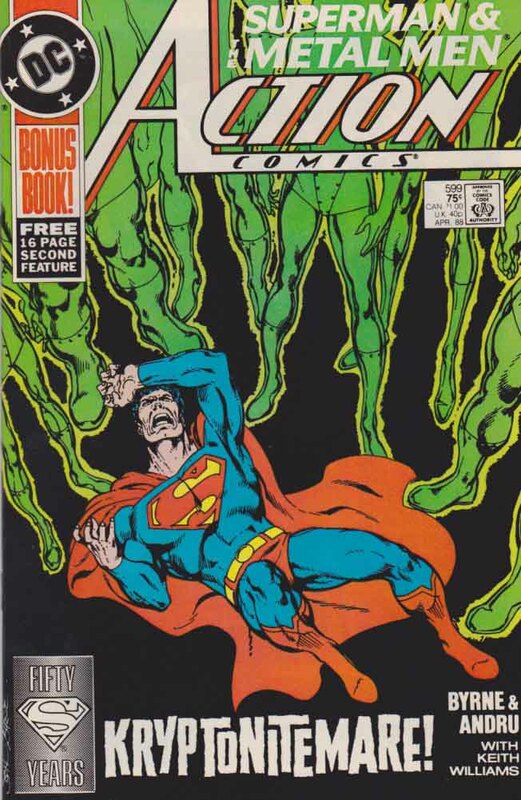 Superman brings a male humanoid back to life after he has been attacked by a Frankenstein-like monster, only to learn that he has made a terrible mistake in doing so. 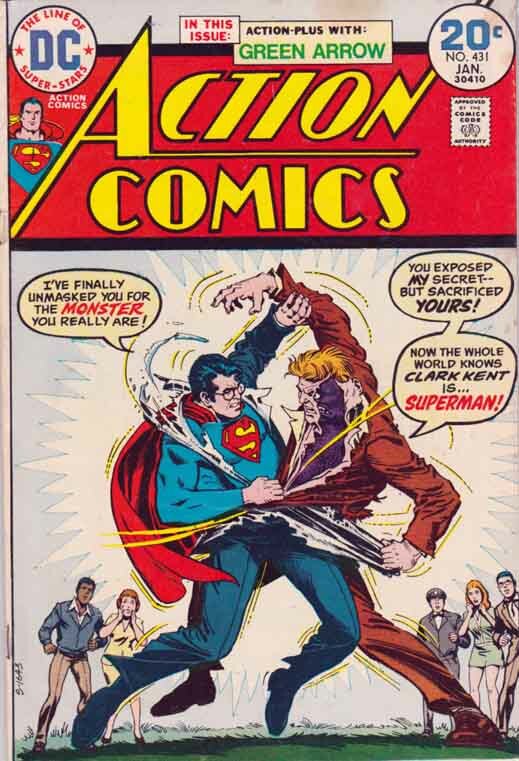 ACTION COMICS #416 (1972) Nick Cardy Cover, Curt Swan Pencils, Cary Bates Story "Superman, You Scare Me to Death!" 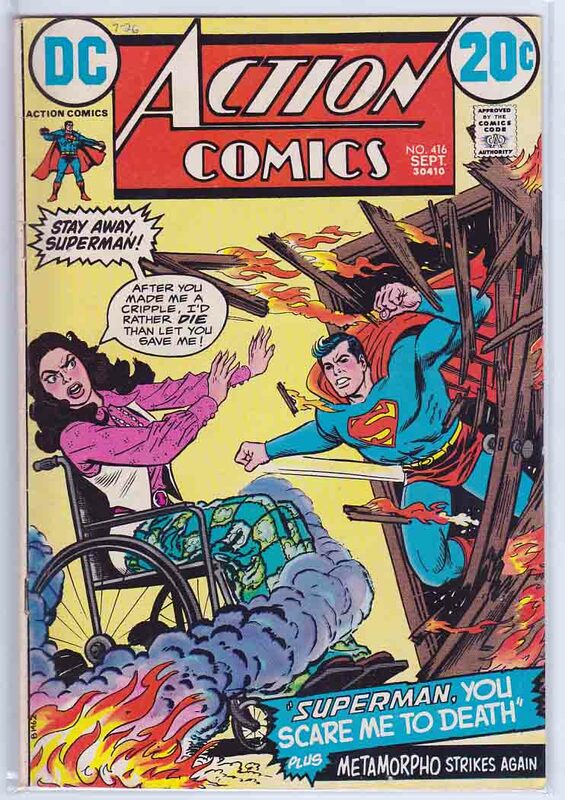 Superman encounters a crippled girl named Christy whom he terrifies, but who likes Clark Kent's company. As a child, she formed a psychic link with a doll, and when the doll's legs were broken in a fire from which Superboy once rescued her, she psychically lost mobility in her own legs and developed a phobia of Superman. 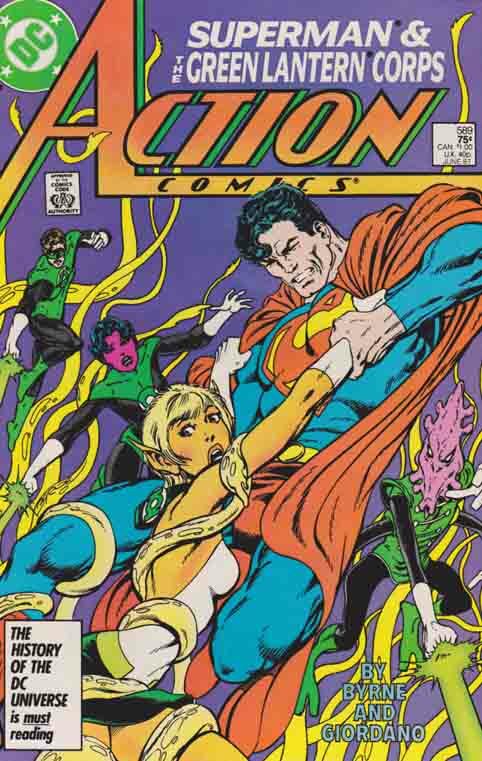 Later, after Superman rescues her from a sea-jacking gang, she regains the use of her legs. 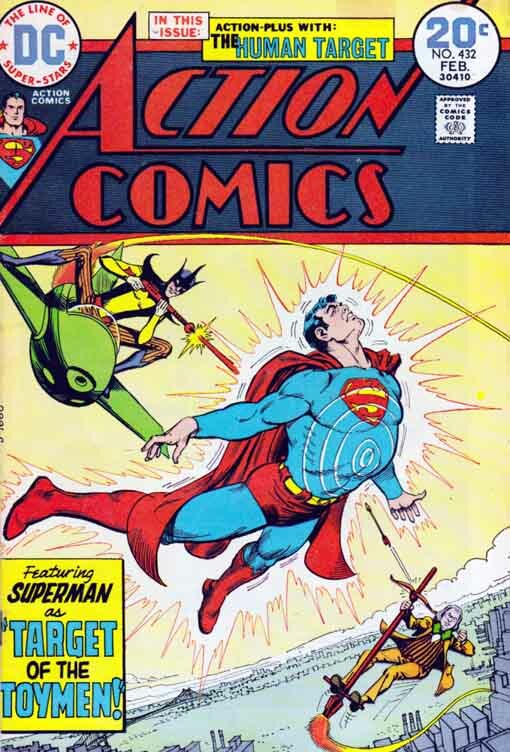 ACTION COMICS #433 (1974) Nick Cardy Cover, Curt Swan Pencils, Cary Bates Story "The Man Who Was Buried on Page 64!" Superman is abducted by three minions of Noam Sythe, who plans to use the combined unused brainpower of them and the Man of Steel to terraform the moon. But Superman realizes the power will cause the moon to explode. 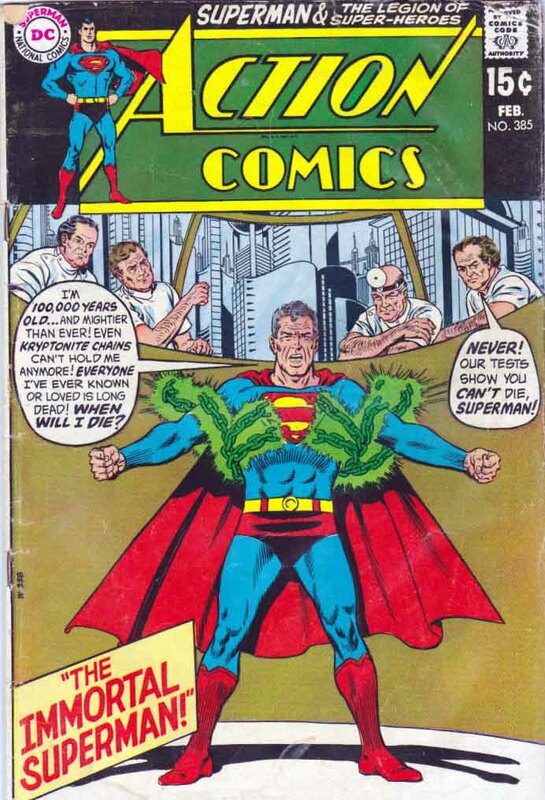 ACTION COMICS #453 (1975) Bob Oksner Cover, Curt Swan Pencils, Cary Bates Story, Batman Appearance "Superman's Fantastic Face-Saving Feat!" 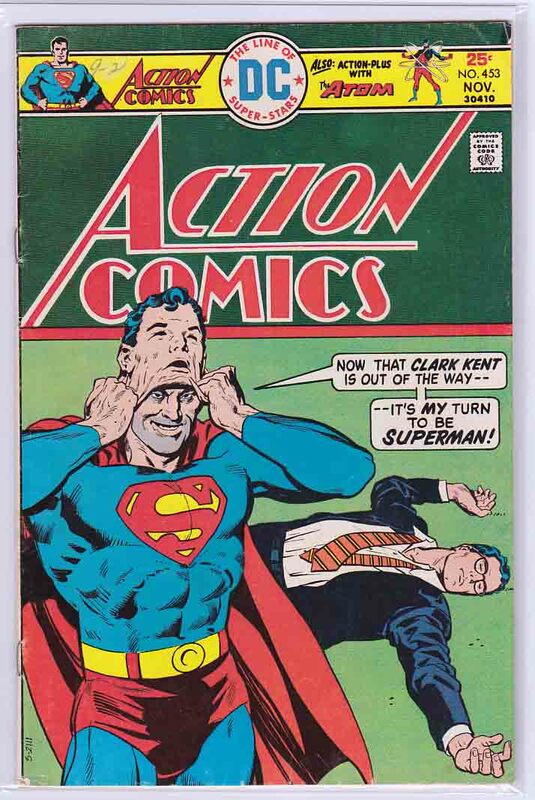 A vengeful gangster switches faces with Clark Kent to put in motion a plot to kill Superman. 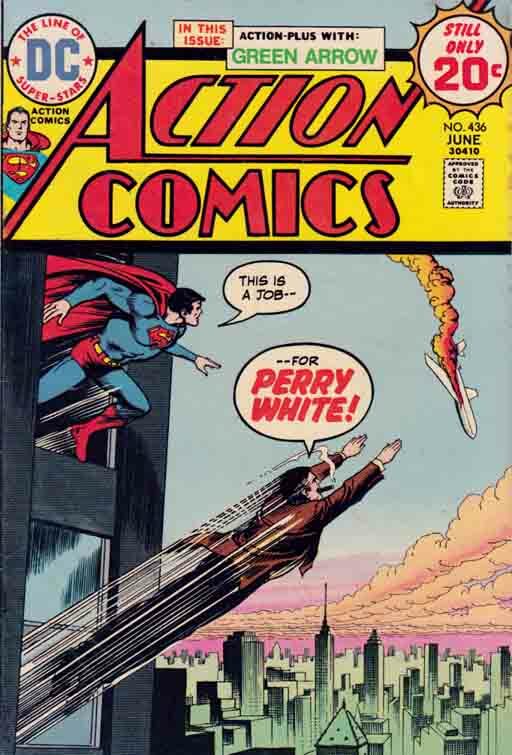 ACTION COMICS #431 Curt Swan Pencils. 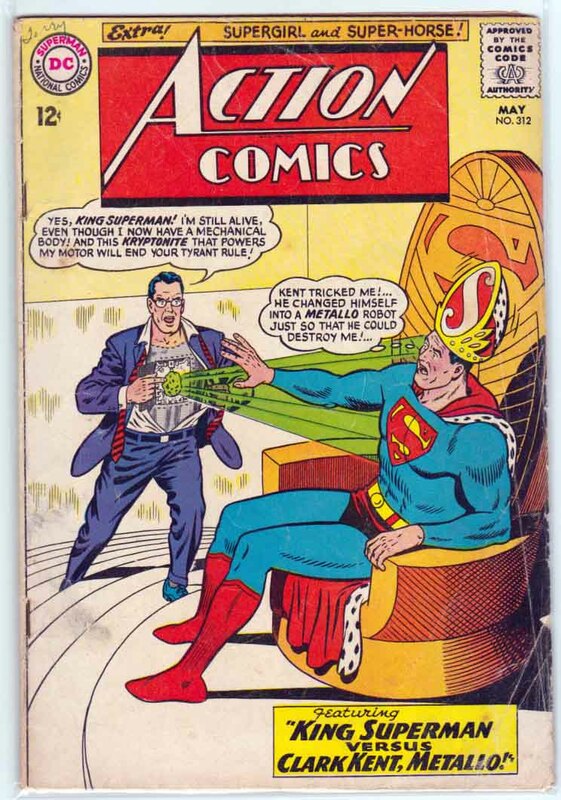 The Monster Who Unmasked Superman, plus Green Arrow in The Case of the Runaway Shoebox. 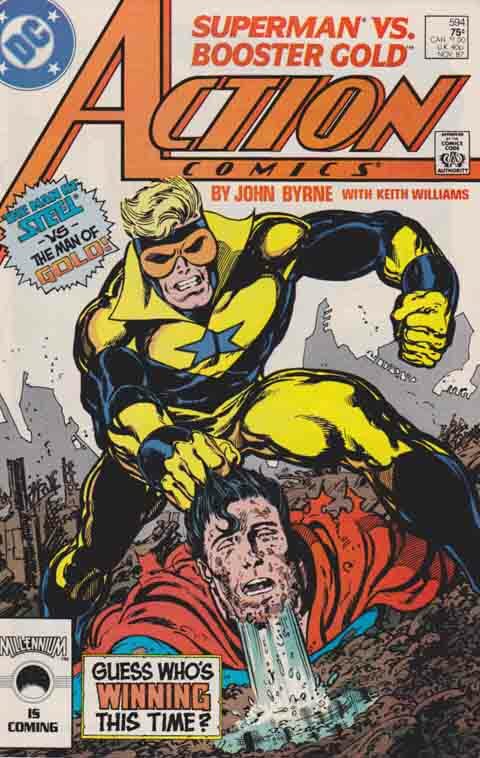 1st Appearance of Toyman. Clark Kent is shooting a commercial at the airport when a criminal similar to the Toyman shrinks and steals a 707. The new Toyman is able to escape by using exploding bubble gum animals to threaten the town below, forcing Superman to abandon the chase to protect the residents. 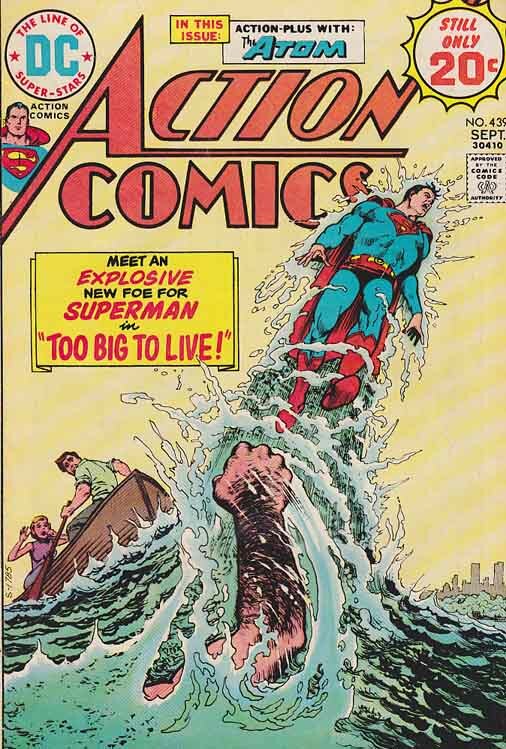 ACTION COMICS #439 (1974) Nick Cardy Cover, Cary Bates Story, Curt Swan Pencils "Too Big To Live!" When Captain Strong and his bride-to-be, Olivia Tallow, are endangered by a super-powerful caveman, Superman lends a helping hand to the sailor. 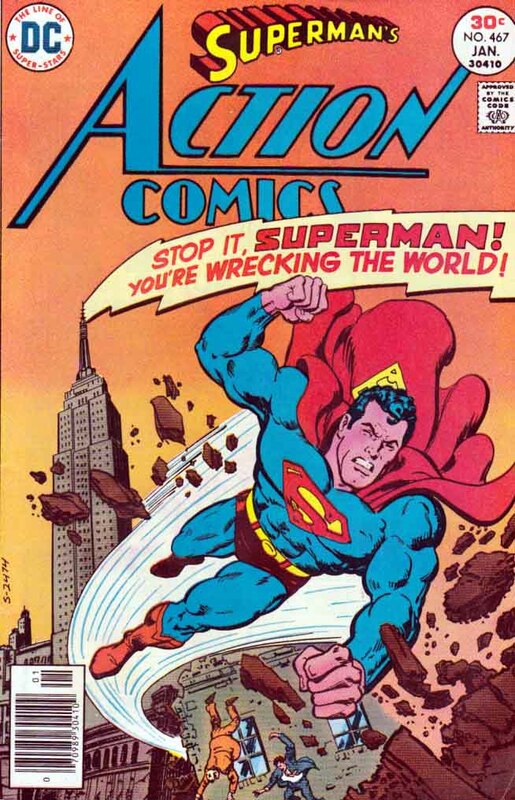 ACTION COMICS #467 1977 Pencils by Curt Swan. 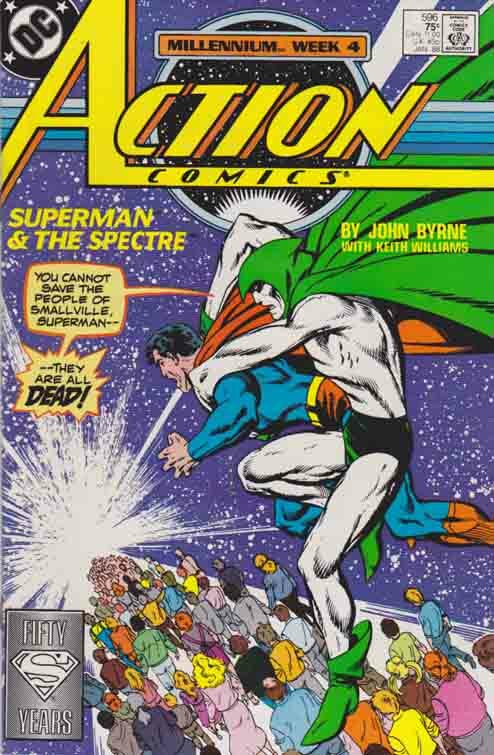 Story by Gerry Conway A criminal scientist uses energy from Superman's own body to create a tidal wave. 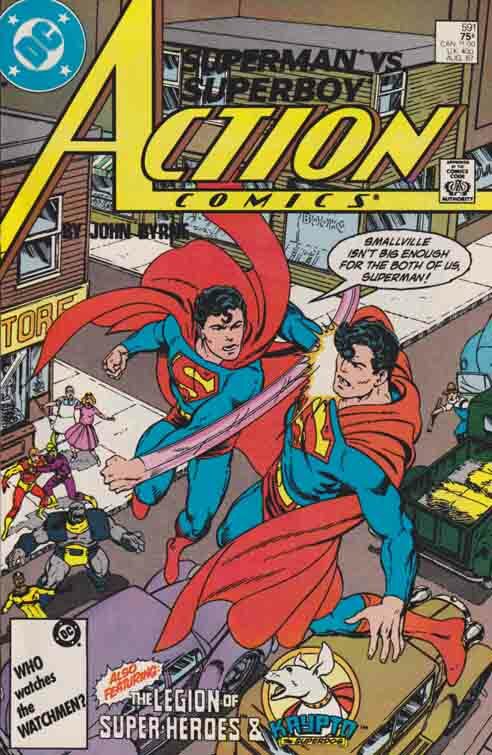 ACTION COMICS #586 (1987) John Byrne Cover, Story & Pencils. Lightray and Orion travel to Apokolips to confront Superman, who is now brainwashed into thinking that he is the son of Darkseid. 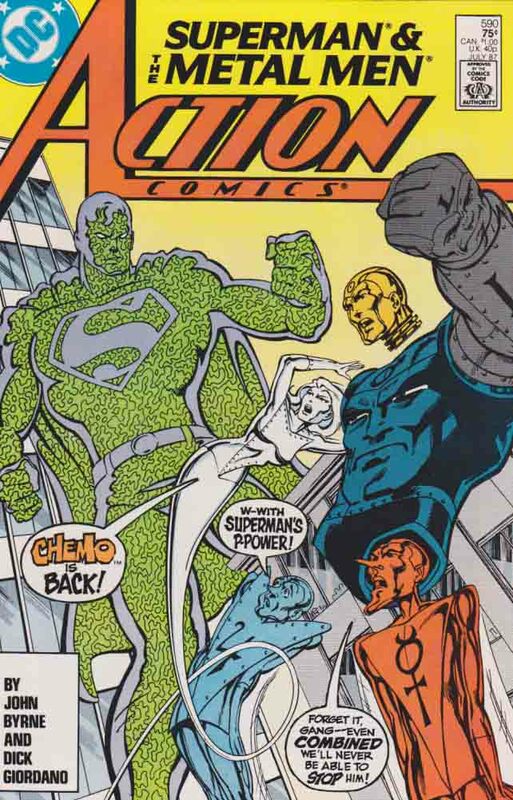 With Darkseid restoring Superman's knowledge of his own powers, the Man of Steel goes to attack Lightray and Orion, mainly focusing on Orion, who reveals to Superman who the real son of Darkseid is. Meanwhile, Amazing Grace tries to seduce Lightray with her power of mesmerizing speech in an attempt to kill him, but fails as he uses his light powers to stun her. 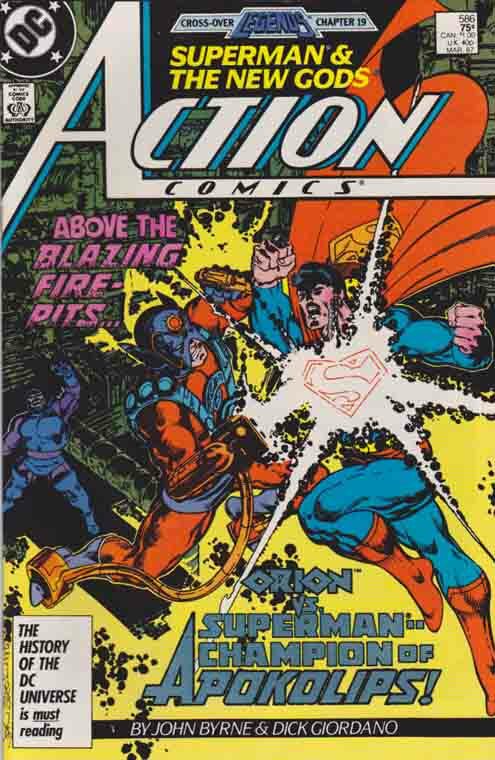 ACTION COMICS #587 (1987) John Byrne Cover, Story & Pencils. "Cityscape!" Jason Blood and his friends are brought to an antique store by Glenda Mark who introduces Jason to the shop owner, Mr. Janke. Intrigued, Glenda examines a new item of a miniature cityscape, but upon opening it she is stabbed in the arm by a sharp protrusion that shoots out. 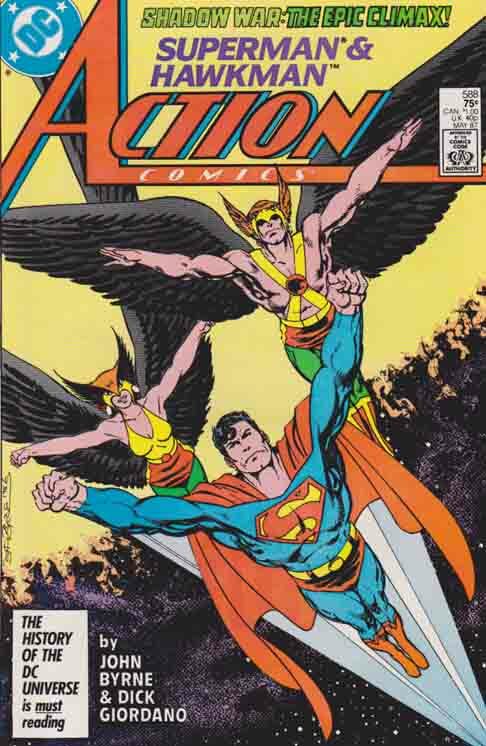 ACTION COMICS #588 (1987) John Byrne Cover, Story & Pencils. "All Wars Must End (part two)" Hawkman and Hawkwoman summon Superman to a captured Thanagarian ship which also contains the subdued Thanarian villains Ved and Rok. 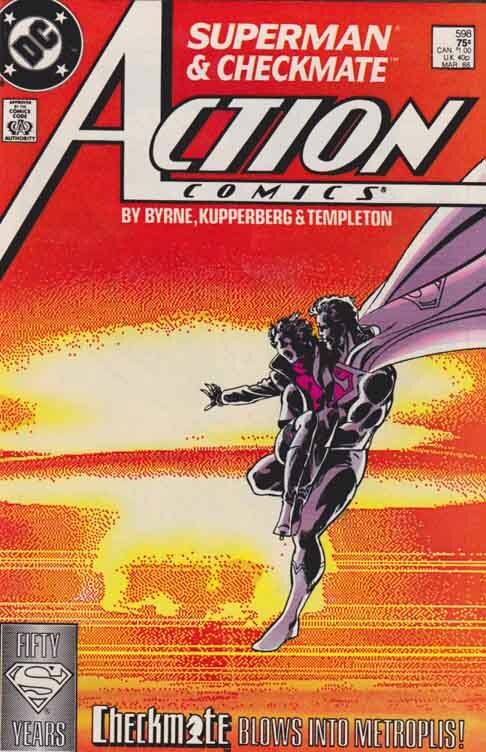 Action Comics #591 (1987) John Byrne Cover, Pencils & Story, Krypto (Pocket Universe) (First appearance) "Past Imperfect"Superman flies after Superboy and the Legion and grabs onto Superboy's feet as the Boy of Steel enters the timestream, but eventually loses his grip and falls into the Smallville of the past where Pete Ross discovers him, mistaking him for Superboy. 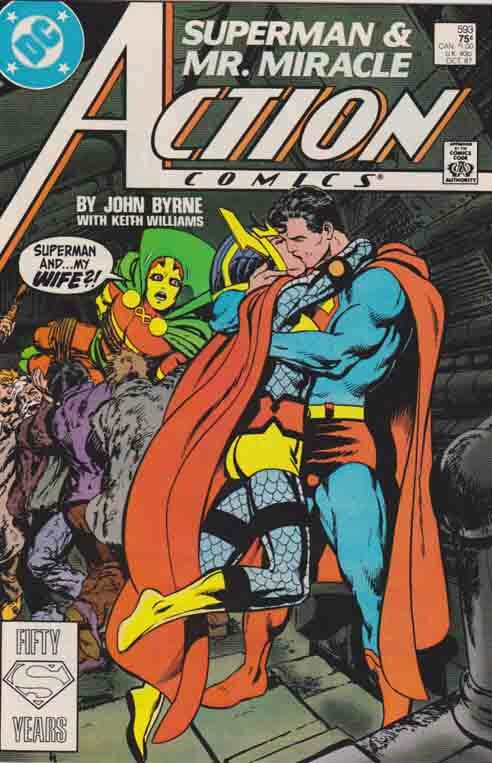 Action Comics #595 (1987) John Byrne Cover Art, Pencils and Story. 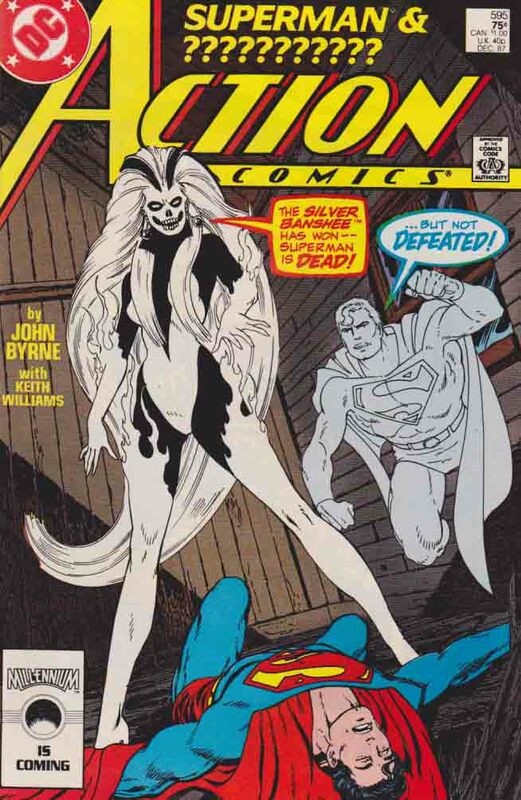 1st Appearance of Silver Banshee. A black-and-white clad woman with a skull-painted face calling herself the Silver Banshee terrorizes Metropolis by rampaging through bookstores looking for a certain book while killing whoever she touches. 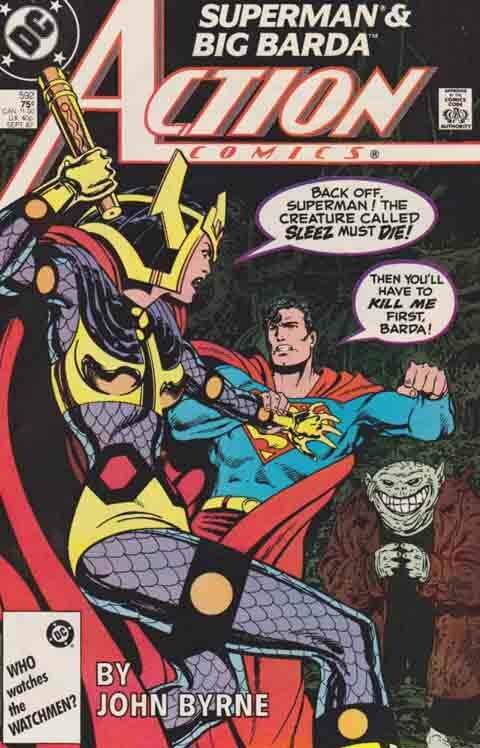 When Superman confronts her, he discovers (though seemingly a bit too late) that it's not her touch that kills, but rather her voice.